Okay, feeling good? Having a nice weekend? Excellent! Let’s make it even better and get started on our dinner preparations. Nothing about making this dish is difficult, but if you’re serving it Sunday, you’ll need to get started on Saturday. 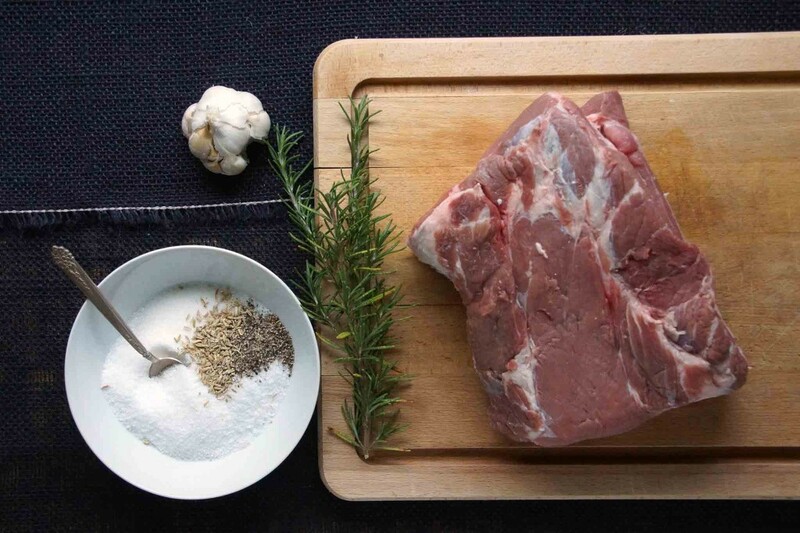 Head off to the butcher’s shop and pick out a nice looking bone-in pork shoulder. 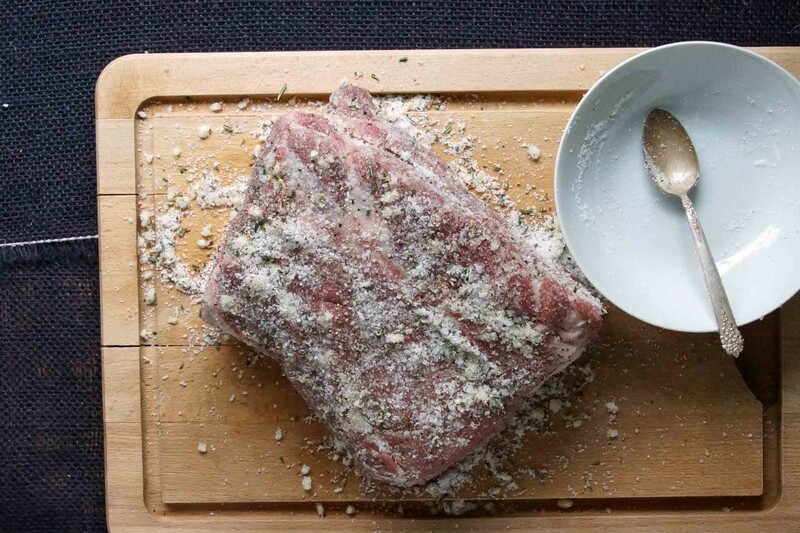 Mix together sugar and salt with fresh rosemary, crushed fennel seeds, and minced garlic and rub it into the meat. 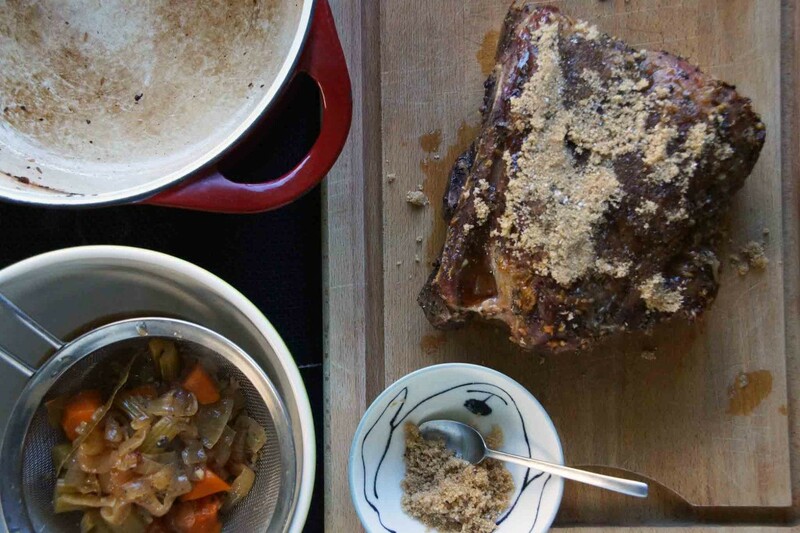 It will seem like way too much but you’ll just have to trust me on this one; the herbs will penetrate the pork and the sugar and salt will keep it moist and flavorful. Go ahead and make the pickled red onions and apples now too; it’ll free up more time for sipping coffee and taking long walks tomorrow. Slice a red onion and julienne an apple. Pour a hot apple cider vinegar brine over the onions and apple, cover, and cool. You’ll end up with more than you need for this meal but you’ll have them around to slip into sandwiches and add to salads later in the week. Okay, let’s cook that pork. We’ll sauté a chopped carrot, some onion, and a couple ribs of celery, then add apple cider and a bay leaf. Perch the pork over the veggies and pop it in the oven to roast, low and slow. 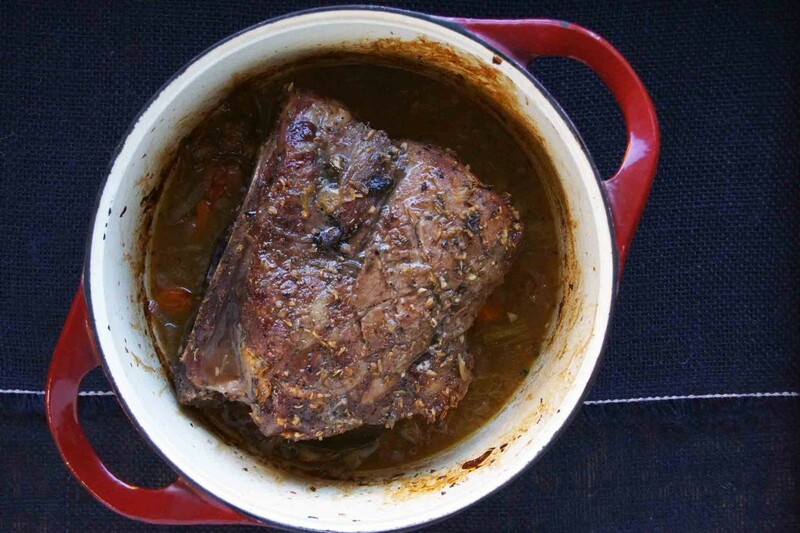 Check in every half hour or so and spoon the aromatic cider over the meat to keep it moist and flavorful. About 4 hours in, it should be looking good and smelling even better. Give it a poke. Tender? Yes, ma’am. Pull the roast out of the pan. Pour the pan juices through a mesh strainer then transfer to a saucepan and allow to reduce to a saucy consistency while you finish the pork. 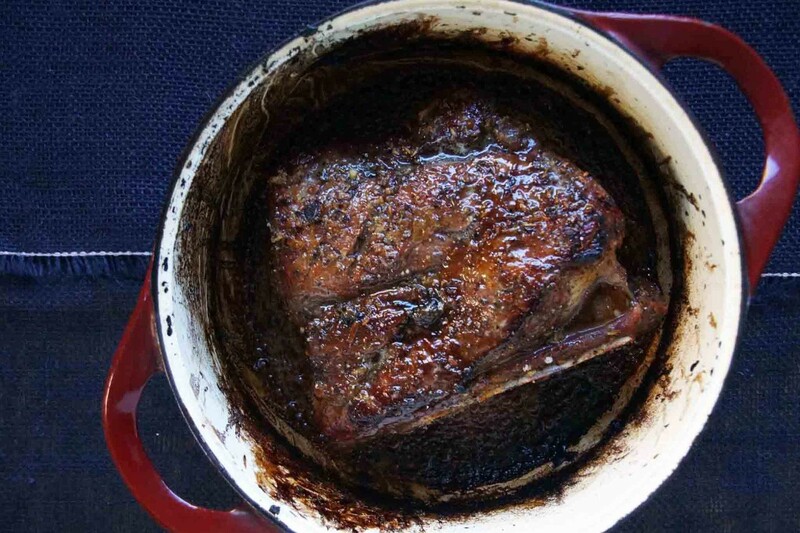 Crank your oven way up to 500°, we’re about to make some caramel-y pork magic. If you’ve ever had the pleasure of eating Bo Ssam, you’ll understand and appreciate what we’re about to do. Pat the pork shoulder with brown sugar then pop it in the blasting hot oven for a few minutes to develop a dark, caramelized crust. Done! Gather up your guests and head to the table. Cut thick slices of pork and serve it with creamy polenta, the reduced pan juices, and the pickled onions and apples. 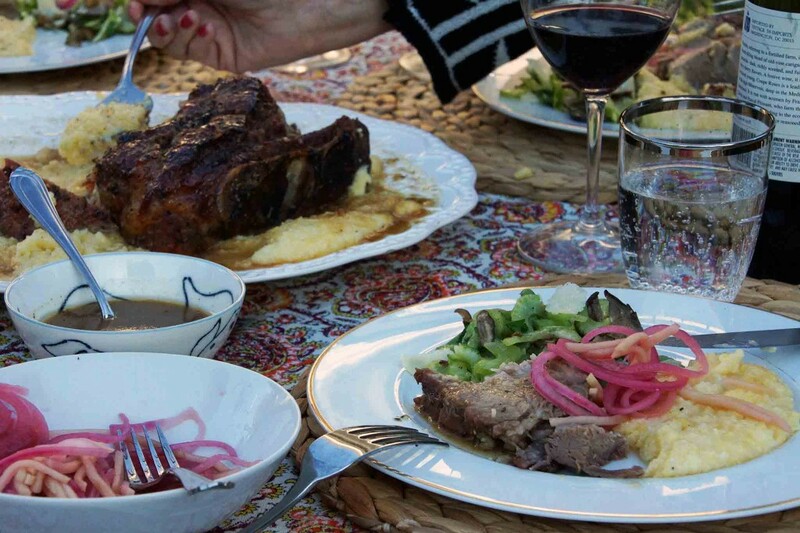 Drink wine, have fun, and do fall dinner the way it’s meant to be done. Serve the pork over creamy polenta or mashed potatoes. This recipe serves 4 generously with plenty of leftover pork that can be pulled off the bone and reheated in the pan juices to dress pasta, make a killer sandwich, or fill gringo tacos. Combine ¼ c. sugar, ¼ c. salt, rosemary, fennel seeds, and garlic in a small bowl. Rub the mixture into the pork shoulder. Place the pork in a large bowl, cover with plastic wrap, and refrigerate overnight. The next day, preheat the oven to 300°. Drain the accumulated liquid from the pork. Heat about 1 Tbsp. olive oil in a large Dutch oven. Sauté the chopped onion, carrot, and celery for a couple of minutes, until the onion begins to brown. Add the apple cider and 2 bay leaves and bring to a simmer. Set the pork shoulder atop the sautéed vegetables, cover, and transfer to the oven. Every 30 minutes, baste the pork with the apple cider. 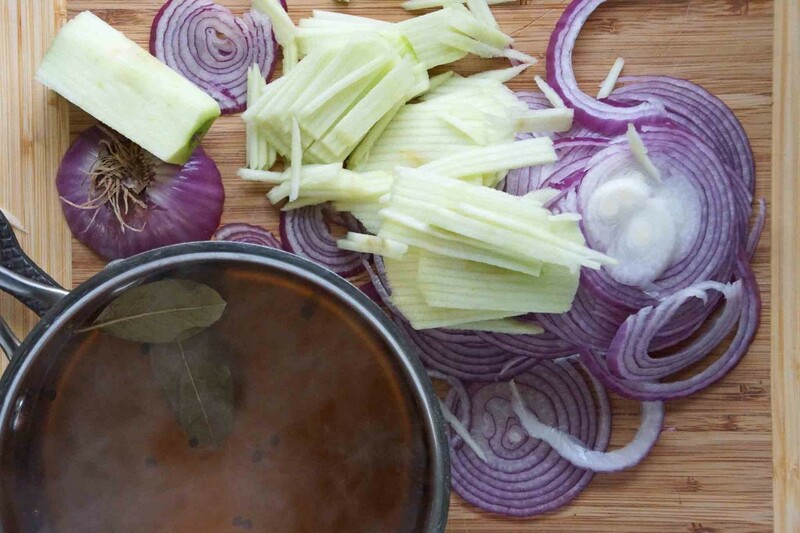 If the pan ever looks too dry, add a bit more cider, chicken stock, or a splash of water. After about 4 hours of roasting, the pork should be quite tender when pricked with a knife. Remove the pork from the oven and turn the heat up to 500°. Transfer the pork to a large plate or cutting board. Strain the vegetables out of the pan juices and pour the juices into a saucepan. Simmer until they've reduced to a saucy consistency. Combine ¼ c. brown sugar with 1 tsp. salt and pat it onto the top of the pork. Place the pork back in the Dutch oven and return to the oven, uncovered, until the sugar melts and forms a dark caramelized crust, about 10 minutes. Let the pork rest for 10 minutes, then cut into thick slices and serve with the reduced pan juices over polenta or mashed potatoes with the pickled red onions and apples. The pickled onions and apples are best made the day before serving. To make them, simply bring the cider vinegar, ¾ c. water, 1 Tbsp. brown sugar, 1 tsp. salt, bay leaves, and peppercorns to a simmer. 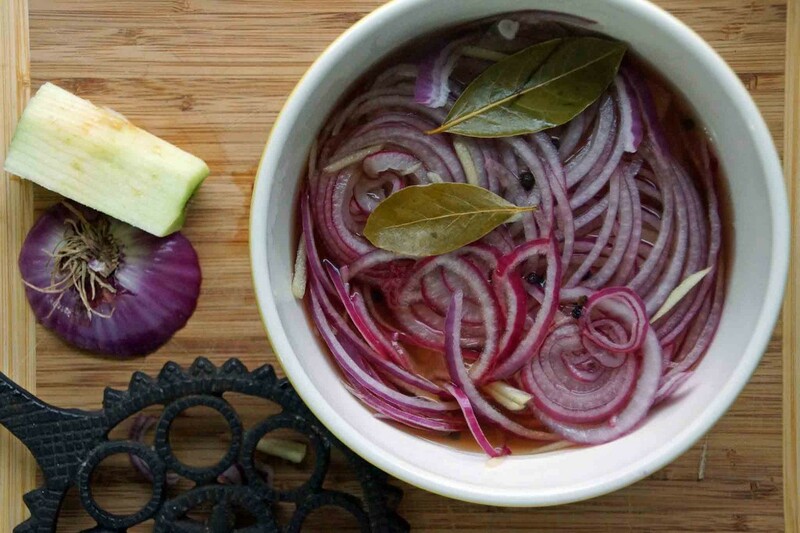 Place the red onion and apple in a medium bowl and pour the hot brine over the top. Put a small plate on top so the onion and apple are fully submerged and place in the refrigerator. Any leftover pickled onions and apples will keep for a week or more. I always find myself thinking pork in the fall. If you like this idea, you may also want to check out my Pork Roulade with Caramelized Fennel & Onions that I made around this time last year. Happy Weekend! I get to vouch for this one first-hand! Thanks for making Dad and me the honored guests – we are still talking about what a delicious meal it was, along with the amazing dessert! And I’m so flattered to get my hand in the picture!!! Looking forward to more great dinners with our awesome hosts! Thanks for sharing so many great recipes! I really love your site. This recipe looks fabulous! I have a dumb question, I have never used a Dutch Oven. Do you put the cover on when you put the pork in the oven? Not a dumb question! Initially, the Dutch oven should be covered. At the end when you crank the heat up and add the brown sugar, you should leave it uncovered–it’ll help a yummy crust to form on the outside! Thanks for the reply. I can’t wait to make this!